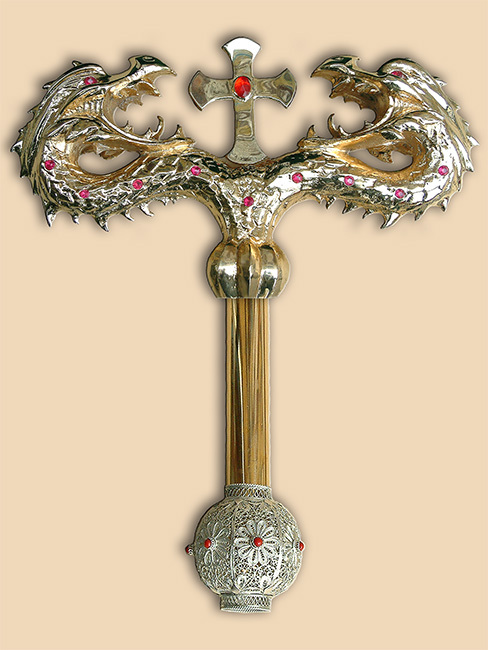 Rust proof stainless steel Bishop's crosier, gilded with 24 K gold, 170 cm high and with 5 detachable parts. Top part has a mounted brass cast dragons, decorated with 22 red corundum rubies. Body, in rustproof stainless steel, ends with one silver filigree apple decorated with 7 natural cred corals. Second part, also has a silver filigree apple decorated with 6 red corals. Third decorative silver filigree apple has no decorative stones. Except for the apples, all other parts are gilded with 24 K gold. Bottom end of the staff has a rustproof steel tip. Material: silver 950,stainless steel, brass, red corundum rubies, red corals, leather, silk. Technique: casting, filigree, granulation, stone setting, gilding. Size: staff 170 cm, dragons 25 cm. Weight: silver filigree apples 170 grams.